Gwendoline Baker, a woman participating in the Sirens of the Seven Seas mermaid event, is killed. Adam moves into his new apartment. Adam has made friends with Hal, a homeless man. Hal asks Adam to buy a gift for his granddaughter. Gwendoline, who was killed with foxglove, worked for a beauty company/pyramid scheme. Jerry finds that her car had been vandalized a couple of weeks prior. Adam buys Hal some new clothes and offers to buy him a haircut and shave so that he can deliver the gift in person. Grover and Danny interrogate Jocelyn Greene, the owner of Plum & Rose Beauty. They question Makani Pula, who vandalized Gwendoline's car. But she had an alibi, as she was in a detox center. Jerry finds the collagen powder dosed with foxglove used to poison Gwendoline at her apartment. 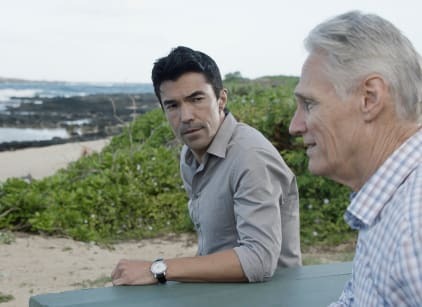 McGarrett and Danny bring in her husband Josh as a suspect since she had threatened to divorce him. Josh said Gwendoline thought there was something shady happening at Plum & Rose. Hal left a message for Adam that he wasn't ready to face his family. Kamekona told Adam to ask himself if he was helping Hal for Hal or for himself. Jerry determines that a gang is laundering money through Plum & Rose. The team finds Jocelyn's husband murdered and she and her two children missing. Jocelyn was researching foxglove so she's the killer. The gang members want to find their cash which Jocelyn had hidden. Danny and Tani find Jocelyn and a thug, who they shoot. But he's the only one who knows where her kids are. Jerry tracks the GPS on the car the gang rented. Jocelyn arrives for the exchange, then Five-0 takes down the gang. Adam thanks everyone for their friendship, and gets a call from Hal thanking him.